What do we all yearn for on a very cold, freezing day – for me it’s Warm Comfort Food! Still in my dressing gown, I can hear the wind eerily whistling down the North East coast of Yorkshire. So far, snow has not appeared here for some reason, but in odd corners of the country it has caused its usual havoc. Tide surges have been predicted, but tucked away in our little house we have no worries as we are about 8 minutes walk away from the North Sea (fingers crossed). Scouring my desktop, I realised that I have the perfect recipe for weather such as this. 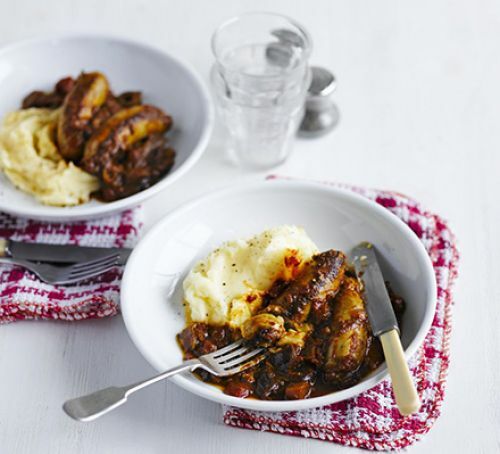 Warm Comfort Food in the guise of a Moroccan Sausage Stew, probable paired with a fluffy mash of both Sweet and Ordinary potato. What could be more comforting than this? This Moroccan Sausage Stew recipe can be made with really good sausages, the best you can get, or with chicken portions. Ras al hanout is my favourite spice at the moment, and I love the mix of a bit of sweetness using the dates with this spice. A fluffy mash will make this a truly comforting dish to eat, so I'll be busy peeling both my sweet potatoes and ordinary ones this afternoon to mash together. Can't wait. In a large saucepan or flameproof casserole dish, heat the oil and brown the sausages with the onions for 10 mins until golden. Add the garlic and spice mix with 75ml water to prevent them from burning, and cook for 2 mins until fragrant. Add the dates and tomatoes, mix well. (If you want to freeze this, stop now and follow the freezing info below). Add all but 2 tbsp of the stock, mix well and gently heat for about 15 mins. Mix the cornflour with the reserved stock and pour into the pan, stirring all the time. Bring to a gentle boil, and simmer uncovered for 5 mins until thickened and piping hot. Serve with fluffy mashed potato (my choice is a mix of sweet potato and ordinary potato mixed with a big knob of butter and lots of parsley). Warm Comfort Food is perfect for weather such as we are having now in the UK. If you want a different type of side dish to partner this Moroccan Sausage Stew recipe, look no further. 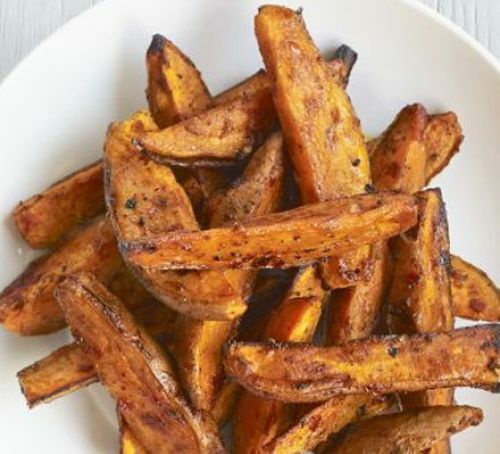 How do you fancy Harissa Sweet Potato Wedges? In keeping with the Moroccan spices used in the Sausage dish, this would be fun. Heat the oven to 200C/180 fan/gas 6. In a large bowl combine the wedges with the harissa. Mix well. Transfer to a baking tray and cook for 40-50 mins until the potatoes are tender and crispy at the edges. Serve with the sour cream mixed with the snipped chives. Oh heavens, Erik’s just called me to go and look out of the bedroom window. It’s snowing – a real blizzard! Looking lovely from inside, but it will be a day of wrapping up. Thank heavens we have chopped loads of wood for our fire. Well, more than ever, think of us tonight, logs burning, candles on for fun, eating our Warm Comfort Food of Moroccan Sausage Stew, and, for us, Mixed Potato Mash. I’m really looking forward to that one. Hope you all are safe and warm, and are enjoying whatever comfort food that makes you happy.